We’ve made asking for help safer than ever. We’ve created a tool for victims of abuse to ask for help, without fear of it showing up in their browser’s history or an abusive partner ever seeing it. A simple icon which can sit on any website and launch a powerful resource to help end domestic violence. Now any website can be a place of refuge. If you need help but are worried about repercussions from a controlling or abusive partner, this is a safe way to find it. With The Women's Refuge Shielded Site, victims of domestic violence access a shielded portal through which they can contact us, find out how to make a plan to safely get out of a dangerous situation, learn how to stay safe online and get answers to questions about what comes next – all without fear of it showing up in their browser history for anyone else to find. Technology has extended the reach of abusers. Victims of domestic violence live in fear of their every move being monitored. An abusive partner may use a phone’s GPS location, a victim’s email or banking passwords, even their web history to keep tabs on them. Making it harder than ever for those looking for help, to find it. We’re working with New Zealand industry and business leaders to stand up against domestic violence. Our goal is to make any website a place of refuge. And you can join us by adding the Shielded Site to your site. 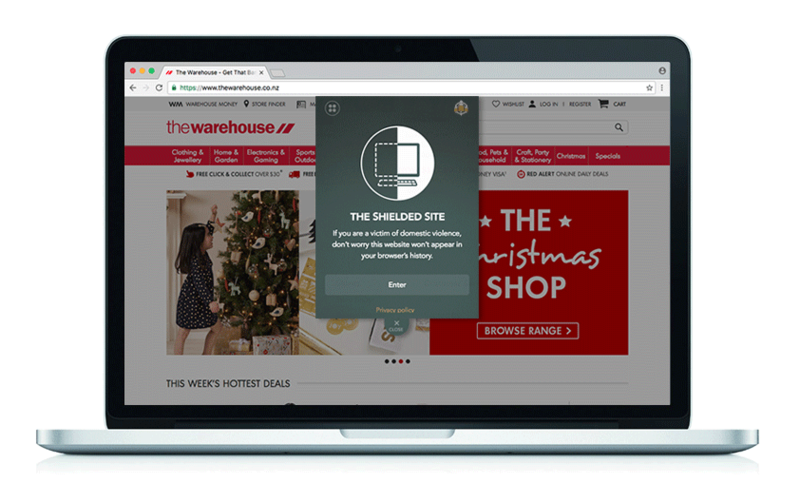 The Shielded Site is simple to add to any company website and is designed to work on desktop, tablet and mobile. By including the Shielded Site tab on your website, you’ll be helping victims living with domestic violence to safely get help. We invite all New Zealand businesses – or anyone who manages their own website – to get involved. Select the tab size you’d prefer on your site. Copy and paste the code below into your website’s HTML. For any technical queries please email support@shielded.co.nz. We would also love to hear from you if you have added the Shielded tab to your website so we can contact you regarding any future updates. Thank you for your support. Click share to help us make more places of refuge and let those living with domestic violence know there is a way they can begin to get help. There are many other ways you can help the Women’s Refuge, volunteering, organising fundraisers, or by making a donation.